Charles Stenhouse (1878-1946) was born in Dundee and studied at Glasgow School of Art. 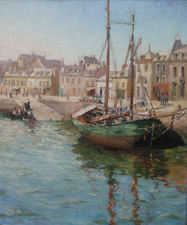 He lived in Glasgow before moving to Crail and painted seascapes, harbour scenes and French landscapes. Exhibited Royal Scottish Academy 9, Glasfow Institute 60, Liverpool 1. The work presented was exhibited at The Glasgow Art Club.